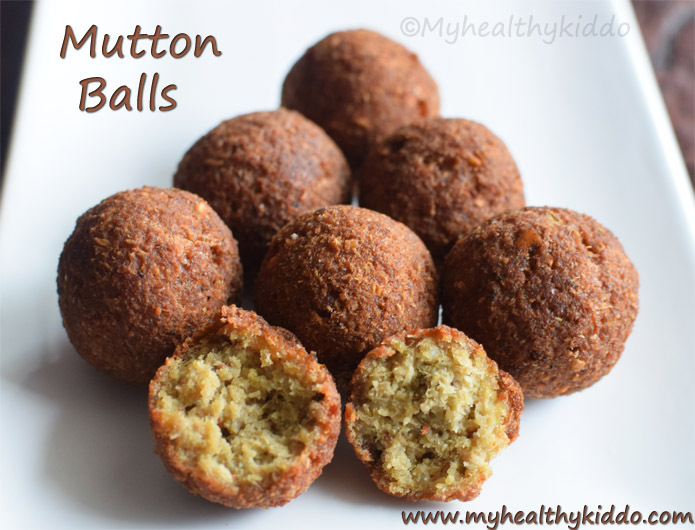 Mutton kola urundai / mutton meat ball is so famous in Madurai hotels/Mess. Mutton kola will be in the menu of all non-veg hotels in Madurai. My personal favorites are kola urundais of Amma mess and Kumar mess. 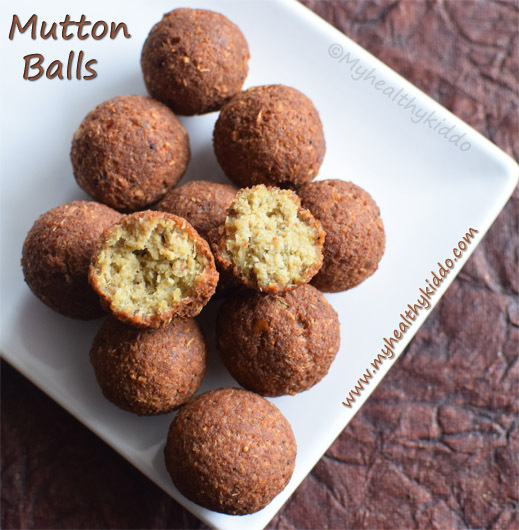 Being hailed from Madurai, I can’t delay to post these mutton meat balls anymore ! Mutton kola urundai fry and gravy are very common in households in and around Madurai. In hotels, they do add egg for perfect shape, but in home kitchen, we don’t mind that ;). In this post, I have followed my mom’s kola urundai recipe, but just added egg at the end for that appealing shape ! Take ¼ cup tightly packed grated coconut, 4 dry red chilli, 1 inch ginger, 6 garlic cloves, 8 small onions, 1 tbsp friedgram(pottukadalai), 1 tsp fennel seeds(sombu), ¼ tsp peppercorns(milagu), 2 pieces(each 1-inch) cinnamon(pattai), 4 cloves(krambu). In a bowl, beat an egg and keep ready. Add all the items listed under "To grind" to mixie jar. Grind well, add ½ tsp salt and just keep aside the mixie jar with contents in it. Take minced meat in a washing bowl. Pour water gently and wash once. Again pour water, add a tsp of turmeric powder and mix well in the water very gently. Take handful of minced meat, squeeze the water and transfer to a colander. Repeat for the rest of the meat. Again, take handful of minced meat from the colander and squeeze well to extract all water in it. Repeat for the rest. Take the pan of washed and squeezed minced meat and heat in medium-high flame. First it will let out some water. Just keep sauteing. In 8-10 mins, it will become completely dry as shown. Switch off and transfer to a plate to cool down. Once cooled, add fried minced meat to the same mixie jar, in batches. Grind well. Add to a mixing bowl and combine well. Add beaten egg and mix well. Pinch out a small portion and roll(neither tight nor loose) like a ball. Once oil is hot, add 1 ball, fry and test for salt. Add meat balls in batches. Do not touch the ball for the first minute. Then, turn the balls to evenly cook in all sides. Use perforated ladle to drain the oil and take out the meat balls. Place them in tissue paper to drain excess oil. 1.Be gentle in washing minced meat, else more meat will be washed away with water. 2.If you use egg, oil will become frothy. Coconut oil will be less frothy. 3.Do not add egg, if you want to refrigerate the meat mix and use later. 4.Do not add oil while sauteing minced meat. 5.Get fatless minced meat as fat will tend to leave oil and make balls disintegrate while frying. 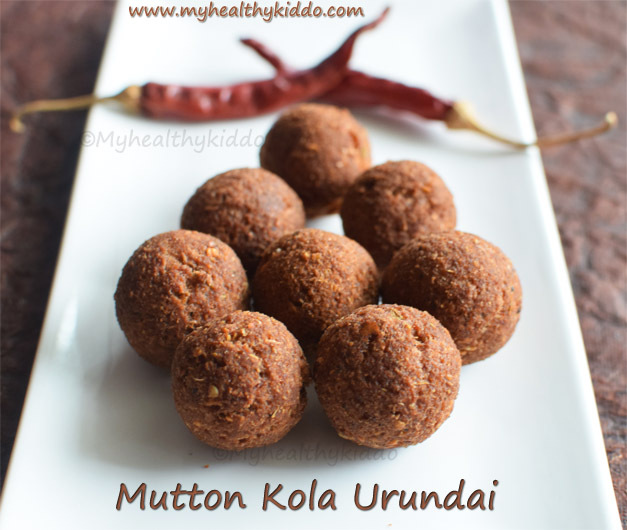 Preparation – How to make mutton kola urundai? 1.Take 1/4 cup tightly packed grated coconut, 4 dry red chilli, 1 inch ginger, 6 garlic cloves, 8 small onions, 1 tbsp friedgram(pottukadalai), 1 tsp fennel seeds(sombu), 1/4 tsp peppercorns(milagu), 2 pieces (each 1-inch) cinnamon(pattai), 4 cloves(krambu). In a bowl, beat an egg and keep ready. 2.Add all the items listed under “To grind” to mixie jar. 3.Grind well, add 1/2 tsp salt and just keep aside the mixie jar with contents in it. 4.Take minced meat in a washing bowl. Pour water gently and wash once. Again pour water, add a tsp of turmeric powder and mix well in the water very gently. 5.Take handful of minced meat, squeeze the water and transfer to a colander. Repeat for the rest of the meat. Again, take handful of minced meat from the colander and squeeze well to extract all water in it. Repeat for the rest. 6.Take the pan of washed and squeezed minced meat and heat in medium-high flame. 7.First it will let out some water. Just keep sauteing. In 8-10 mins, it will become completely dry as shown. Switch off and transfer to a plate to cool down. 8.Once cooled, add fried minced meat to the same mixie jar, in batches. Grind well. 9.Add to a mixing bowl and combine well. Add beaten egg and mix well. 10.Pinch out a small portion and roll(neither tight nor loose) like a ball. Once oil is hot, add 1 ball, fry and test for salt. 11.Add meat balls in batches. Do not touch the ball for the first minute. Then, turn the balls to evenly cook in all sides. Use perforated ladle to drain the oil and take out the meat balls. Place them in tissue paper to drain excess oil. Yummy mutton kola urundais are ready.. Serve hot or warm..
Be gentle in washing minced meat, else more meat will be washed away with water. If you use egg, oil will become frothy. Coconut oil will be less frothy. Do not add egg, if you want to refrigerate the meat mix and use later. Do not add oil while sauteing minced meat. 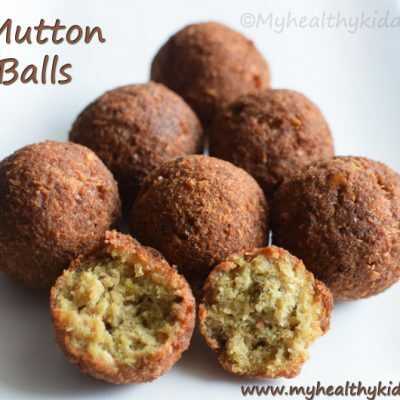 Get fatless minced meat as fat will tend to leave oil and make balls disintegrate while frying. Homemade Butter Recipe | How to make butter at home ? Hi Shyam, Can i follow same recipe if i want to replace mutton with paneer. Yes, you shall refrigerate and fry next day.. Keep it out of the fridge, at least for 1 hour before frying.. Add egg and mix just before frying.. You shall skip egg if you don’t want perfect round shape..